Prep ahead breakfast or snack for the week! Very packable! Freeze half the batch! These muffins are not very photogenic but they are SO yummy and SO easy! The end of May brings the start of our seasonal farmers market. It's so nice to finally buy local fresh fruits and vegetables after a very long winter season. Every stand had baskets full of rhubarb which is currently in season. Last week I picked up about 5 large stalks and have been meaning to do something with it. The lack of breakfast food selection in my refrigerator and cabinets motivated me whip up a batch of these delicious cinnamon rhubarb muffins after the kids went to sleep tonight. It took about 20 minutes to mix them up and 16 minutes to bake them. Exhausted children were sleeping by 7:20 and muffins were done by 8:00! The recipe makes 24 muffins so I usually freeze half the batch. Rhubarb actually has quite a few health benefits. It is an antioxidant and has anti-inflammatory properties. Rhubarb is very tart. The recipe calls for 1 1/2 cups of brown sugar plus a sugar topping (which can be omitted). If you are concerned about the sugar content in the recipe, substitute 1 cup of agave syrup for the 1 1/2 cups of brown sugar. Omit the sugar topping and shake some cinnamon on top of each muffin before baking. *If you do omit the topping be sure to shake some cinnamon on each muffin before you bake them. In a separate bowl, combine egg, milk, oil and vanilla; stir into dry ingredients just until moistened. Fold in rhubarb. 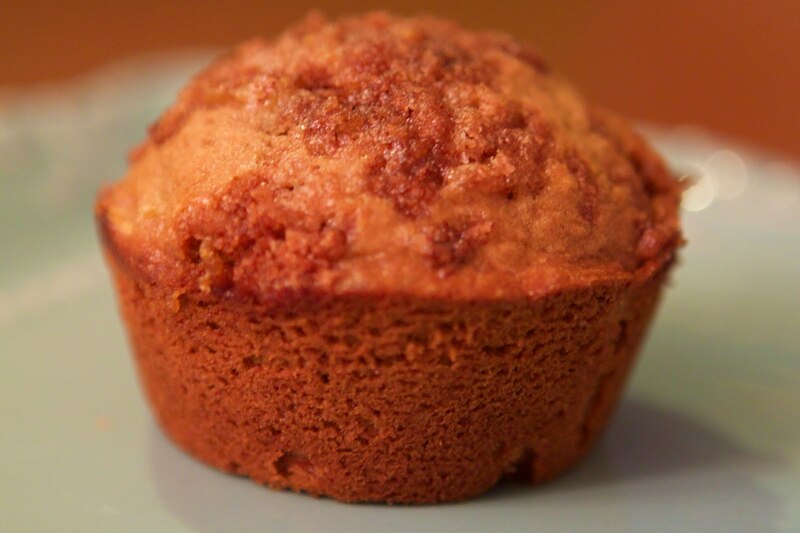 Fill greased or paper-lined muffins cups about half full. Combine topping ingredients; sprinkle over each muffin. Bake at 375 degrees F for 16-18 minutes or until muffins test done. Copyright © PrepAhead and Dine In: cinnamon rhubarb muffins. All Rights Reserved.